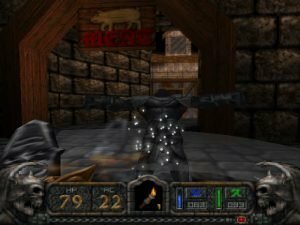 Hexen 2 is a really good fantasy action game, though getting through it isn’t always easy. No matter which character you choose, this walkthrough will guide you all the way to the second episode. By the end of it, you’ll have a general idea of how the game’s puzzles are structured and will have a better grasp of going through the other episodes. 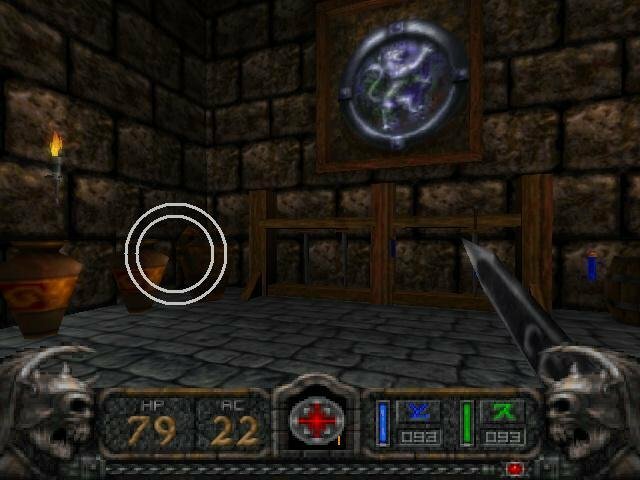 Enter the crypt behind you and find the button in the left corner (attack it for it to activate). Enter the secret passage. Hit the wall panel on the left side of the gate. Exit the crypt. Follow the dark tunnel until you reach a dark room with a tomb. 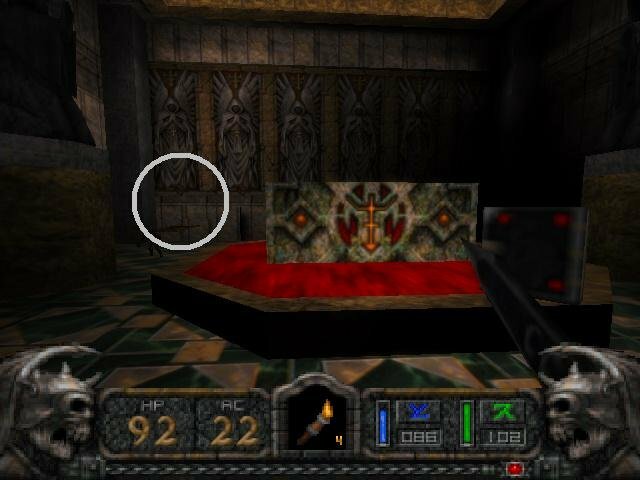 Find the panel switch, move the tomb and push the panel underneath to open the door. Go back to the bridge and look for the portal underneath. Strike the winch to open the door, kill the wizard and collect the Bones of Loric. Open the gate and jump into the teleporter to return the starting crypt. Time to go back to the green pasture and visit The Mill. Go through the narrow tunnels. When you find the Torch, go ahead and grab the Chaos Device hidden over the cave entrance. Take the right teleporter and find the mill, but notice you need the Mill Key. We need to use the mill to cruch them old bones. Jump back and take the other teleporter, and you’ll eventually make it back to where you’ve entered the area. Go back to the wizard’s laboratory and enter Barbican. It’s a linear road from here. When you find the catapult, jump and strike your weapon on it to fly over the wall (don’t forget to open the gate after you land). When you find the drawbridge, jump into the watery moat (watch out for that squid) and swim to the left (the right part of the moat is locked right now). Make your way through the underwater sewage tunnels until you find an opening into the outer perimeter of the castle. 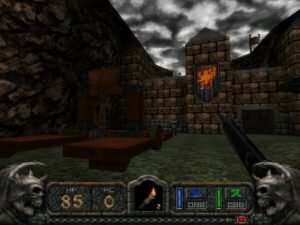 Once you’ll find your way into the courtyard, you’ll come under attack from a crossbow sentry on the second floor, and around the corner you’ll find a big gate which requires the Castle Key. 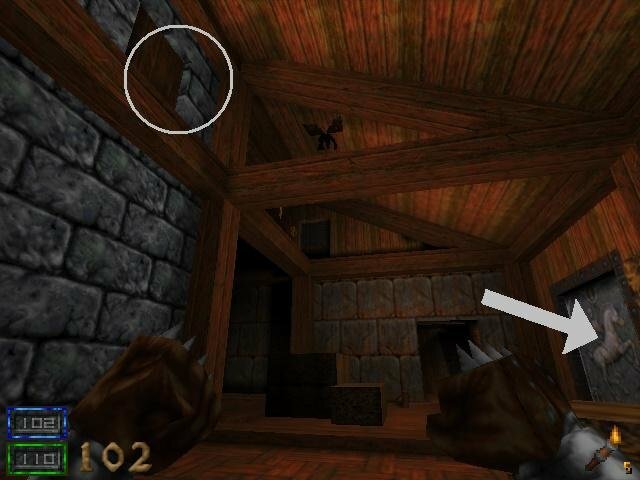 As you come back down from destroying the crossbow, notice a door that will lead to the guard’s sleeping quarters and lever controlling the drawbridge. Continue a bit more and you’ll find a boiling pot and a wooden grate looking down, and also a cracked floor in a corner that leads into a room below. When you reach the broken stairs, just push one of the barrels and climb up. Kill the wizard and smash up his desk to find a switch panel leading back to the locked castle gate. Well that was pointless. Did we miss something? Go back to the guards’ living quarters and notice the a strange symbol next to the weapons rack, hidden behind the stacked vases. Hit it, go through and take control of the crossbow. Hit the tower enough times and you’ll eventually destroy it, revealing a teleporter. Next to the destroyed tower you’ll find the Mill Key. You can jump into the teleporter to reach a nearby platform with some extra items. Go through the wizard’s lab and continue to the mill. You now have the dust of Loric. Hop into the wizard’s golden stew. Find the living quarters again and locate the boiling pot next to the drawbridge controls. Jump down and continue to the broken stairway room. Open the dead wizard’s balcony and jump into the moat. As you swim in the dark water, you’ll notice a golden seal to your left – bump into it and you will use the Potion of Mithril Transmutation, transforming the golden seal into wood. You can then attack it, break it and reveal the Castle Key. Time to enter the castle. As you start, notice the giant magical barrier to your right. Go straight and you’ll find your first golem – deal enough damage and they’ll drop. There are no puzzle items in the meat shop, but it does have some useful items. Returning from the meat shop, turn right and you’ll come across the mysterious ‘Shoppe‘… On the second floor you’ll find a bed with a chest and a strange wall. Hit the wall and it will slide open. As you exit the Shoppe, turn right and you’ll eventually find the tailor’s home. In his room upstairs is a locked cabinet needing the Tailor’s Key. Continuing down the road from the tailor will eventually lead you unto a platform high above the central courtyard where you’ve entered the level. Jump back down, and when you approach the meat shop head right to find the last place of interest in this area – the Raven’s Nest (wink, wink). Brake the wooden shelves behind the counter for a teleporter leading to some goodies. Find the entrance to the Inner Courtyard. Head to the Forgotten Chapel for now. Explore the chapel until you find a tomb. Notice some odd geometry on the upper left corner. Push it and you’ll reveal a secret passage under the tomb. Find the body encased in webs and gib the poor sucker to spawn the Tailor’s Key. Explore until you teleport into a pool of water. Notice the submerged pressure plate – step on it and go back to the courtyard. Find the tailor, open his cabinet, break the false wall and obtain the Disrupt Magic Scroll. Go to the central courtyard with the giant statue and the giant magical barrier. Walk into it. It’s a pretty linear path from here. At the end of it all you’ll find a locked door, needing the Treasury Key. Damn. Look around until you find the entrance to the stables. 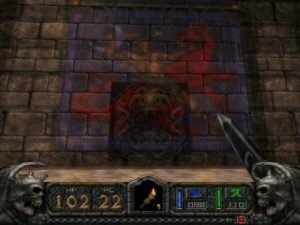 Find the ladder leading up to the higher floors – you will be in a room with a sealed barrier (which has Famine painted on it). Use the stairs to access the wooden beams high up and make your way to a secret wooden door. Inside you will find a switch opening the sealed Famine door underneath, revealing the Shovel. Go back to the forge and walk around the tree until a giant hole appears. You’ve just found the Treasury Key! You will also find a locked door in this level but which requires the Stable Key. For now head back to the Palace Entrance. Inside the treasury you will find the Amulet of Hunger. Head back to the Shoppe and enter the secret passage on the second floor. You now carry a Bead of Glass. As you enter the level, head left (therefor opposite of the guillotine) and you’ll find an unmarked wooden building. Go inside and you’ll notice ‘something unusual about the fireplace’. Climb up carefully and you’ll find a grindstone – walk into it and you’ll spawn the Lens of Seeing behind you. Go back to the large room with the fancy table and tapestry, the one where “Invisible forces” were at work. You will now notice the tapestry is transparent and reveals a teleporter. Walk into it and you’ll find yourself in a pool greeted by two tough golems. Walk through the magical white portal. “You have been given the power to destroy the crystal golem”. Find the nearby undertaker (the tombstones and crosses should tip you off). Locate the secret button and activate it. A secret passage will eventually lead to the holding cells and the teleporter to the crystal golem and Famine. 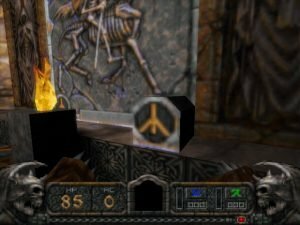 Feel free to use a Tomb of Power – just note that walking out of a level when a Tomb of Power is activated sometimes crashing the game. After defeating the crystal golem you will find another teleporter leading to the level with Famine. There is no secret trick in defeating Famine – just great reflexes. The same goes for every major boss character in Hexen II.